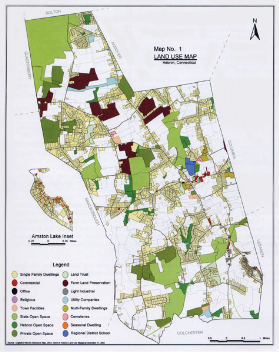 The Town of Hebron’s Planning and Zoning Commission approved the Town’s 2014 Plan of Conservation and Development on June 10, 2014 and it can be viewed by clicking on the link below. The Planning and Zoning Commission, with the input of many Boards and Commissions and Town staff members and the general public have updated the Plan of Conservation and Development and have been working on this project since 2011. The previous Plan was adopted in 2004. The Commission held numerous meeting and sought out ideas from other boards and commission and the public in an effort to make the update a thoughtful and comprehensive process. The Plan is a document that lays out a vision for the community. It contain a series of goals and policies for the Town and defines a framework for how we would like to see the town grow over the next 10 – 20 years. The Plan contains information on how the Town has developed over the past decades and how it is expected to grow in the future. It contains goals and policies regarding the natural resources in our town, such as wetlands, watercourses, aquifers, soils, farmland and open spaces. These goals and policies are the basis for many of the land use regulations that protect these resources. The Plan contains a number of maps showing planned open space, other natural features, the business districts in town, and will contain a future land use map. The Plan also contains goals and policies for the business areas of the town and provides guidance for how we want the business district to develop. The Plan also contains guidance for housing policies, town facilities and other important issues. Why was it being Updated? Every Town is required by State law to have a Plan, and to review and update it at least every 10 years. It is increasingly necessary to have an updated Plan to apply for State grants; but, it is even more important for a Town to keep its Plan current and have a “big-picture” document of how we want to grow.